One of the most striking works held in the Detroit Institute of Arts' formidable collection is Caravaggio's Martha and Mary Magdalene (c. 1598). 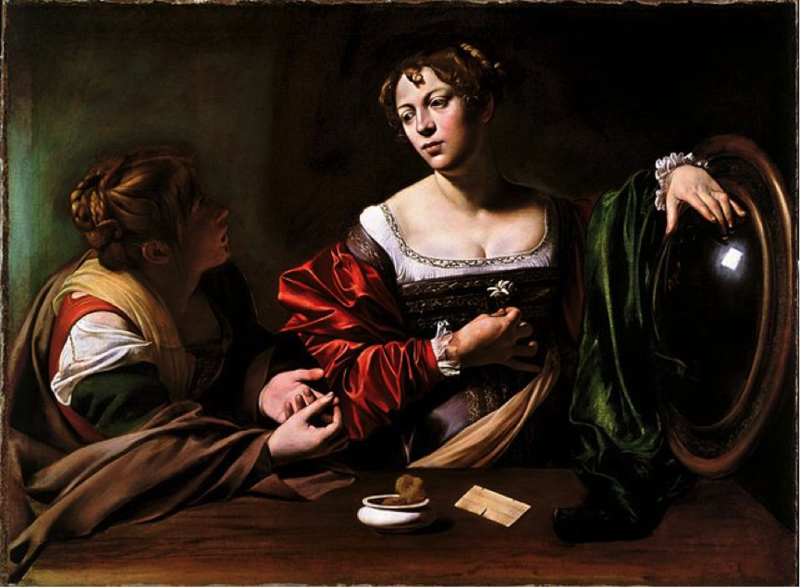 A grand example of the artist's chiaroscuro style of intensely contrasted regions of darkness and light, the painting depicts a virtuous Martha's strenuous efforts to convince Mary to turn away from her libertine lifestyle and to embrace piety. The painting's classic religious conversion story roughly parallels the trajectory of the painter's art historical assessment. Brilliant but badly troubled, Caravaggio garnered fame in Rome, quickly and flamboyantly, died violently at age 38, and, despite having produced numerous commissioned works for rich patrons throughout Italy, disappeared from the radars of art historians and critics for three centuries and change. Not until the early 20th century would he be reborn through rediscovery. Juxtaposing Caravaggio's reputational rebirth and Mary's spiritual rebirth makes for an intensified viewing. The one resonates with the other, amplifying the painting's punch. Alongside this aesthetic value, Martha and Mary Magdalene can also yield a strategic value to the city it calls home. Detroit, like Mary, has an opportunity to undergo a dramatic, and quite literal, renaissance. As Detroit's bankruptcy proceedings continue to unfold, once again some creditors and commentators are arguing that the city should sell off the DIA's art collection to pay off the city's creditors, among whom are thousands of retired city workers. The pro-liquidators would have the pensioners vote against a federally mediated Grand Bargain that is designed to cushion the blow to their benefits plans and prevent a sell-off of DIA art. Symbolically and politically, the fate of the Caravaggio and all the other works held under the DIA's stewardship, hinge on the outcome of a stark choice confronting the city. Shall the city become a post-bankruptcy exemplar of municipal resilience and transformation, or a poster-child for new experimental forms of what some refer to as disaster capitalism? This is the fundamental question the pensioners' vote will answer. Ultimately, if Detroit's aim is rebirth, the city will have to vigorously rebut the shortsighted reasoning of some of its creditors, and instead implement a long-term urban design strategy that foregrounds the city's art, and, in particular, the DIA. Choosing to become an art center is often considered largely a matter of gathering a critical mass of artists and institutions that train, nurture, employ and showcase them. But it is equally accurate, and arguably more important, to see the decision as a commitment to investing in two types of problems. The first problem type concerns all the controversial and at times scandalous matters of art forgery and authentication, piracy, repatriation battles, and perennially present appetency --the early modern Caravaggio and his wealthy Roman patrons knew it then, just as the present-day Gagosians and Poly Auctions do now-- of art to serve as an emblem of the ultra-rich, an adornment like a Sneetch's belly star, and nothing more. But these are, ironically, good problems for cities to have. They entangle a gaggle of debated viewpoints that hem together strains of ethics, law, cultural criticism, the humanities, and, crucial in the context of bankruptcy, assessments of one of capitalism's most stupefying exercises in excess--the apparently upper-limitless valuations attached to high art objects. These are the problems of Paris, Los Angeles, Hong Kong, Toronto, New York. These are the problems of vital, culturally wealthy cities. Infusing the discussions within and about Detroit with them will not rid the city of its more tangible woes. But it is inevitable that the infusion would place the city in good discursive company. An additional salutary by-product? A bold choice on Detroit's part would likely inspire other cities to not go quietly into an artless night. The DIA has come to occupy so central a role in the bankruptcy proceeding that its fate has political consequences not only locally and regionally, but as well globally. Other financially distressed cities are looking on, particularly in Europe. Keeping the DIA's collection and choosing to aim for global relevance also means embracing a fundamental problem of our fractured, frenetic age: rampant meaninglessness facing so many in a world whose degrees of risk, opacity, hardness, and sheer velocity outstrip most scales. Ambitious museums and radical architectural forms can serve as secular Meccas for those who live in their vicinity, certainly; but, as importantly, institutions like the DIA also function as planetary way-stations for pilgrims worm-holing through international airports from city to city, many looking to understand their planet-roaming as something more meaningful than even their most transactionally meticulous spreadsheet would indicate. Can a solitary DIA pull off this existential task? Within the context of the other material links working like so much connective tissue to anchor Detroit in the flows of people, money, goods and ideas streaming between the world's cultural hubs -- its International Airport, its culture industry, the research universities, the daily examples of resiliency that its residents perform -- we should believe so. 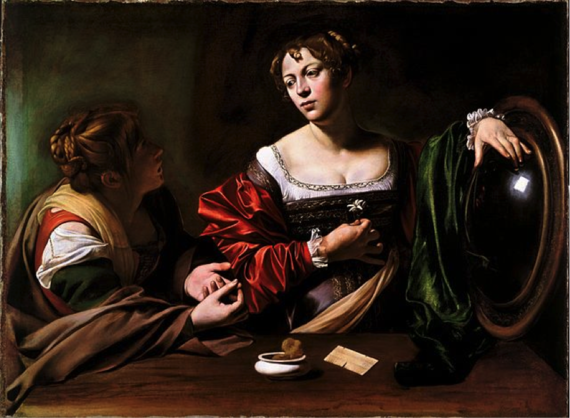 Critics have argued that since Caravaggio likely used courtesans as models for Martha and Mary Magdalene that the conversion story is undermined. But against the backdrop of the momentous decision Detroiters are mulling, a better interpretation might read Caravaggio's choice as indicative of the crucial roles that real people --the workers, mothers, teachers, retirees, the destitute, the children, and even the criminals of Detroit-- play in this metropolitan drama, and the power of great art to illuminate the direct connections between real peoples' lives and questions of massive personal, political and societal consequence. Everyone in the city is confronted with the choice of Detroit's possible futures. And each one will bear its consequences. Detroit's best option, as with Mary Magdalene, is conversion: civic rebirth. Speramus meliora; resurget cineribus ("We hope for better things; it will arise from the ashes") is the city's motto, after all. It should also be the key to Detroit's vision of the future.